All my items have a full money-back guarantee - if it's not as described you can return it for a full refund. P&P charges for bidders outside the UK: Please note that I send ALL international items tracked, which costs more than the standard airmail rate. 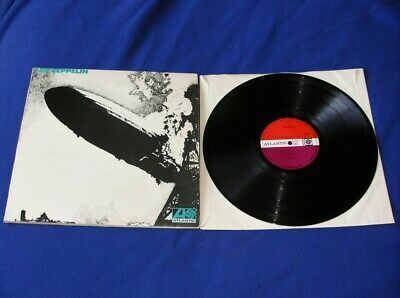 This is the first UK pressing of Led Zeppelin's debut album. It has Superhype credits on the labels, uncorrected matrix numbers and the famous turquoise text on the cover. The cover has various signs of age and use, including creases and wear etc, but is intact and complete. There are creases near both opening edges, some laminate lift near the spine, horizontal creases/cracks around the spine and a couple of small tears at the openings (one on either side, both less than 1cm). The top corner at the opening has worn through to a small (1cm) corner split, and a very tiny one (just a few millimeters) is at the bottom opening corner. There are no other splits to any of the seams. There is a worn area at the centre of the spine, although it is NOT a split. The playing surfaces of the vinyl show lots of marks, scuffs, lines etc, many of which LOOK quite prominent, but surprisingly, despite its appearance, the record plays to a high standard. I have played both sides of the album (twice - once through the speakers and once through headphones) and was impressed at how well it played, in spite of the numerous marks on the disc. There is some background noise and crackle in the quiet parts and the run-ins/outs, fades, silent grooves and intros, and a few places where you get some short-lived clicks, but there is nothing overpowering anywhere. The only tracks with any noteworthy issues that warrant specific mention were 'Babe, I'm Gonna Leave You' which had some more obvious clicks than other tracks, and 'Your Time is Gonna Come' which had some brief noise during the quiet organ intro. Obviously, listening through headphones revealed a bit more extraneous noise than listening through the speakers but on neither play-through did I hear anything that would warrant play-grading below Very Good, and side two, especially when played out loud sounded Excellent for the majority of the side. I'm going to be cautious, because of how the album looks, and give it an overall play-grading of Very Good (VG), but much of it is considerably better than that. This is a play-grading, based on how the record sounds. A visual grading would be lower. Please check out my other items and take advantage of reduced postage costs for multiple buys. Information about descriptions and gradings. My items are always described accurately and fairly. I always do my best to point out any blemishes which might detract from the item and all photographs are of the actual item you will get. I am aware that different grading systems have different definitions and so I try as much as possible to describe items in plain English, rather than simply using gradings. Where gradings are given these are based on the UK RECORD COLLECTOR GRADING SYSTEM. This grading system differs from some other grading systems, in particular the Goldmine grading system. Please make sure that you are familiar with the UK record collector grading system before you bid. Visually-graded vinyl vs play-graded vinyl: Many people collect vinyl and never play it, whereas other people collect records because they want to play them. A visual grading will identify physical flaws (such as scratches) and can help determine whether a record has been cared-for properly, but it will not identify noise or crackle caused by non-visible sources. Most vintage records are likely to have some background noise even if they look perfect. I believe that records are for playing and so I try to play-grade records whenever possible. I always state in the listing if I have played a record prior to listing it. If I have play-graded the record I will usually only give a brief description of how the record looks (i.e. not a visual grading). The grading in the listing will be a play-grading and may be slightly different from the grading that the record would receive from a purely visual inspection. Most vintage records are not 100% perfectly flat and so I will only mention this aspect if it is very significant or has an impact on the way the record sounds. If I haven't play-graded the record, it will be given a visual grading. Play-grading MONO records: Mono records and stereo records have different grooves. A stereo record produces a stereo sound via both lateral and vertical groove modulation whereas a mono record is not intended to produce any sound from vertical modulation. Playing a mono record with a stereo cartridge will create distortion because it is trying to pick-up the vertical (stereo) part of the signal, whereas this is not intended to be heard on a mono record and so is just noise. Using a pre-amp with a mono switch will eliminate the noise caused by vertical modulation leaving just the lateral groove signal which is how the record was intended to be heard. Based on the assumption that most people choosing to listen to a mono record will have the right equipment to listen to it, I play all mono records via a pre-amp with a mono switch. My play-grading is based on how the record sounds when played through a mono switch. If you do not have a mono switch on your amp or pre-amp you will be reproducing the noise from the vertical part of the signal and so the record will not sound as good. This is not any fault of the record, it is inherent to playing any mono record through a system that it was not designed for. I have some very simple terms and conditions. Please read them and ensure that you understand them before bidding. Thank you. My items are fully guaranteed - if it is not as described you can return it for a full refund, including postage. Refunds for visually graded records which are returned based upon the buyer's assessment of the record's playgrade, will not include postage costs in either direction. Your bid is binding, so please make sure you have READ and UNDERSTOOD the WHOLE LISTING before you bid. I will not accept returns where the buyer has not read or not understood something which is stated/shown in the listing. I accept Paypal and postal orders (in UK Sterling GBP) for all purchases. I also accept cheques (in UK Sterling GBP) on orders OVER £50. Please pay for your item within three days of the auction closing. If you are intending to bid on other items and wish to pay when they have closed, please contact me to let me know. I reserve the right to cancel any transactions and offer the item to the second highest bidder if no contact or payment is made within three days. I care about the records I sell and believe that they need to be carefully and securely packaged to ensure that they survive their journey through the post. Vinyl is removed from the sleeve for posting and the contents will be protected with rigid cardboard stiffeners. Packages are labelled "Do not bend" and securely sealed with "FRAGILE" parcel tape. I support the use of recycled materials and so I may sometimes use recycled packaging. If you wish your item to be sent in entirely new packaging please let me know before paying for it. Thanks. My P&P charges are 'totally transparent'. Please read below and if you have any questions about P&P costs please contact me BEFORE you bid. Thank you. Sending items costs more than just the stamps on the package, but I try not to charge more for packing and posting your item than it actually costs me to do so. I need to cover the cost of packing materials, plastic sleeves, new inner sleeves (where applicable), transportation, fees and charges associated with sending the item (including fees incurred to receive the cost of postage and, where applicable, currency exchange) etc. To cover some of these expenses I add a nominal figure to the basic cost charged at the post office athough the actual cost to me is always higher than this. I do not view P&P costs as a means of making money. To quote an exact cost for every LP is difficult because of the wide variance in weight (e.g. Abbey Road weighs around 230 grams whereas Led Zeppelin III weighs around 390 grams). But the majority of single LPs, when packed, will weigh around 550 grams and I have based my P&P rates on this. Double LPs will be charged as two LPs, triple LPs will be charged as three LPs. Box sets etc will be charged according to weight. If, when you receive your item, there is a significant discrepancy in your favour, please contact me and I will refund the difference. I offer three UK services. I DO NOT offer 'click and collect', 'collection in person' or FREE postage, so please do not select these options if they appear in the invoice. UK Standard service - Items valued up to £20 are sent using either Hermes courier or Royal Mail Second class. Usually delivered within 3-5 days of despatch. The cost is £3.95. UK First class recorded post. The cost for one to three LPs is £5.50. Usually delivered within one day of despatch. For more than three LPs please enquire before bidding. UK Special Delivery - Any order valued over £80 will be sent fully insured using Royal Mail Special Delivery (next day delivery guarantee) and the total cost of this will be £9.35 for one to four LPs and £12.00 for five or more LPs . Please wait for my invoice before paying. Overseas orders will ONLY be sent tracked and/or signed. First LP or 12" = £13.60, each additional LP or 12" add £2.20. First LP or 12" = £17.50, each additional LP or 12" add £3.80. Overseas orders valued over £80 will be insured for an additional £2.90. Overseas orders weighing more than 2kg or high-value orders may be split into two or more packages as appropriate so they can be sent using Royal Mail's Small Packet Rate, so please wait for my invoice on larger multiple purchases. Please note that overseas orders outside the EU need a customs declaration with the value of the package. If you have any queries please email BEFORE you bid.